When people ask me how to lose weight I tell them that when starting a weight loss program they need a plan. Sure you could wing it and try to get through it by sheer will power and hope for the best. However, I have found that when you want to lose weight it requires some fore thought and planning. How many times this happened to you? Hunger strikes and you find yourself standing in front of the refrigerator grabbing things haphazardly and before you know it, you’ve eaten a bit of everything and are now feeling guilty and miserable, so you resolve to resist the urge to over eat next time. Only you still haven’t got a plan so next time when hunger strikes you make a quick trip to the drive through and order a super-sized meal. And the cycle continues. The point is; if you haven’t sat down to chart your plan you’ll just stumble along hoping for the best with the chance that you may or may not see results. This is where a weight loss meal plan is of the utmost importance. meets your specific needs. Each meal plan contains a combination of foods which provide optimal results. The biggest advantage to following a well-designed meal plan is that one is likely to be more disciplined about what to eat and when to eat. For example if you know that your next snack is a protein shake at 4:00, you’re able to resist the urge to eat a snickers bar at 3:15. 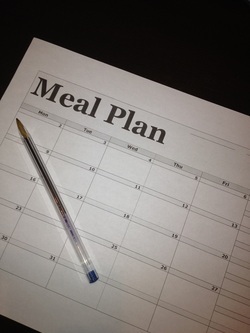 Below is a sample meal plan for an individual with the goal of losing weight. This is just one day in an entire month with the foods planned for the days before and after complimenting the foods shown below. This is just a sample of what one day's meal plan could look like. I make each plan according to individual goals and preferences. Take a look at my service page and see which plan is best for you.